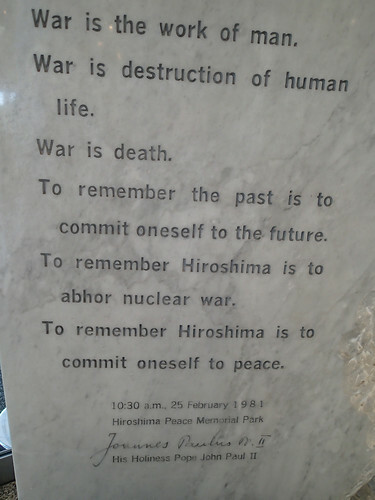 We traveled to Hiroshima to visit the Peace Memorial Park and learn about the Atomic Bomb devastation that caused Japan to surrender to the Allies at the end of World War II. According to Japan Guide, Hiroshima (広島): Is the principal city of the Chugoku Region and home to over a million inhabitants. When the first atomic bomb was dropped over Hiroshima on August 6, 1945, the city became known worldwide for this unenviable distinction. 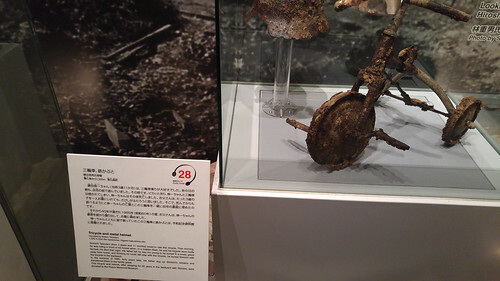 The destructive power of the bomb was tremendous and obliterated nearly everything within a two kilometer radius. From Koyasan we made a return journey down the picturesque Nankai cable car and Nankai railway to Shinimamiya where we rejoined the JR train network. From there we had brief train rides for a few minutes on the JR Yamatoji Rapid Service for Osaka station, where we switched to another train for a few minutes to reach Shin-Osaka station. 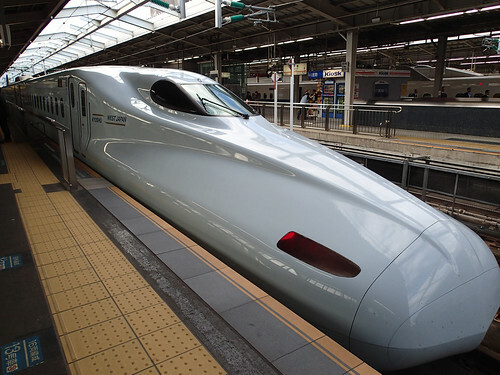 The next 90 minutes was spent on the Shinkansen SAKURA 561, which was such a nice and fast experience that I lost track of time and my wife had to remind me that we needed to get off at Hiroshima Station. 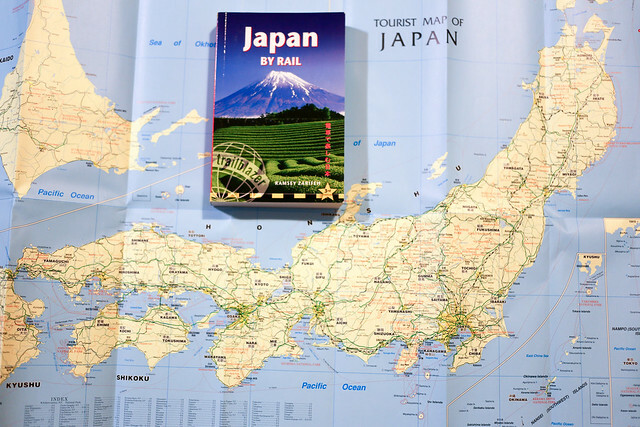 If we had traveled to Hiroshima direct from Tokyo we could have used our JR Pass on the JR Tokaido/Sanyo Shinkansen route to enjoy a fast 5 hour journey on Hikari and Sakura trains with a transfer of trains at Shin-Osaka Station. Direct Nozomi trains take about 4 hours to reach Hiroshima from Tokyo but these trains are not covered by a JR Pass. 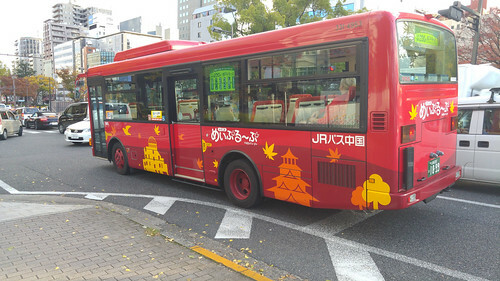 From Hiroshima station we were able to catch the meipuru~pu Hiroshima Sightseeing Loop Bus (free for JR Pass holders) to a bus stop within a few minutes walk from our hotel. The ANA Crowne Plaza Hiroshima had superb service and was very well priced. Benefits for IHG members include free wifi and bottled water. All guests get a Sleep advantage kit including green tea and bath salts. We especially liked the refreshing heated eye masks. 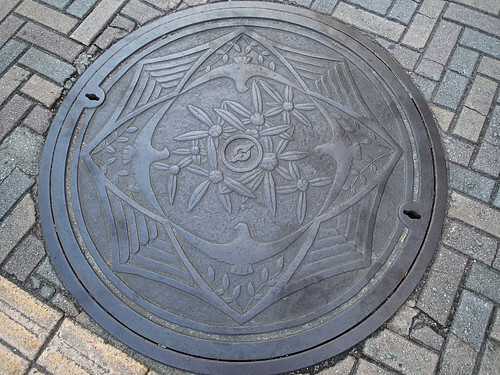 Hiroshima is a city of peace, even it’s manhole covers have peace doves on them. 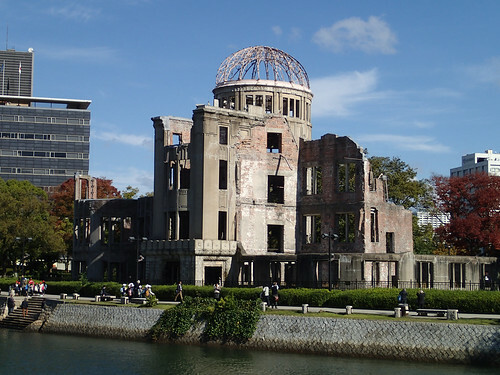 According to Japan Guide: Hiroshima’s Peace Memorial Park (平和記念公園, Heiwa Kinen Kōen) is one of the most prominent features of the city. Before the bomb, the area of what is now the Peace Park was the political and commercial heart of the city. For this reason, it was chosen as the pilot’s target. Four years to the day after the bomb was dropped, it was decided that the area would not be redeveloped but instead devoted to peace memorial facilities. 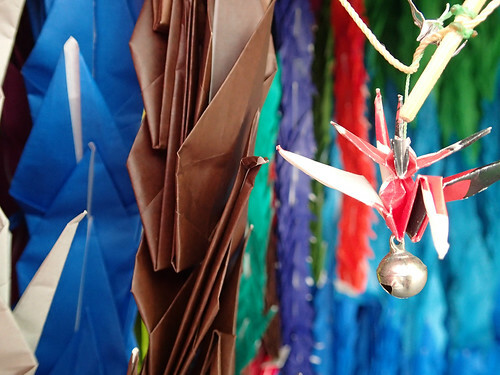 Visiting the Hiroshima Peace Memorial museum, seeing the A-Bomb Dome and Paper Cranes for peace display was an emotional experience. 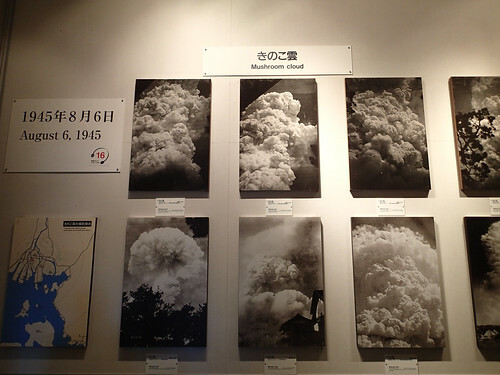 Almost all of Shukkeien Garden was obliterated by the World War II Atomic Bomb blast. 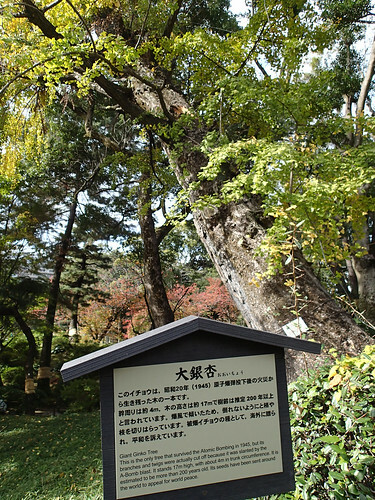 The only surviving plant was a Giant Ginko tree (below). 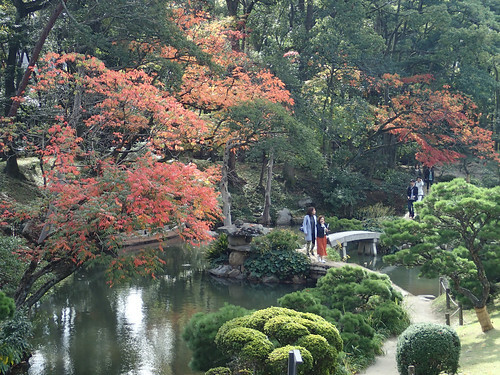 According to Japan Guide: Shukkeien’s (縮景園) name can be translated into English as “shrunken-scenery garden”, which is also a good description of the garden itself. Valleys, mountains, and forests are represented in miniature in the garden’s landscapes. Through careful cultivation of the land and vegetation, the garden mimics a variety of natural formations and scenic views. 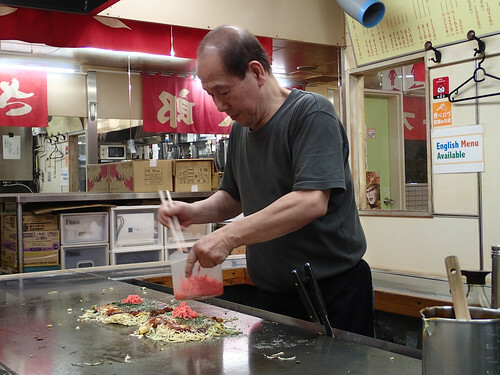 Hiroshima’s local speciality is it’s own style of Okonomiyaki. 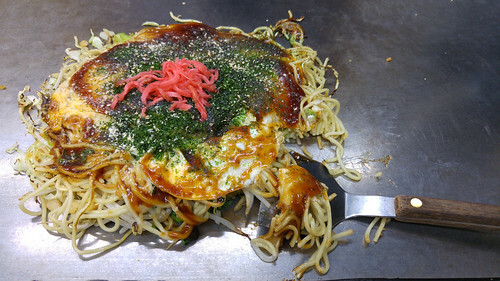 The local version of the dish is characterized by only a thin layer of batter and a generous amount of cabbage on top of yakisoba noodles. We found a small place upstairs and inside Okonomi-mura that made vegetarian Okonomiyaki (a kind of Cabbage pancake) on the spot. Look for this menu, they use olive oil not beef fat. 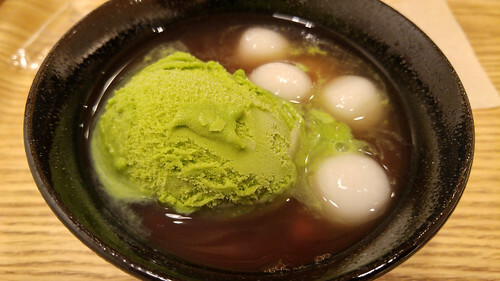 Afterwards we tried some Japanese desserts at a shop called Very Berry Soup. 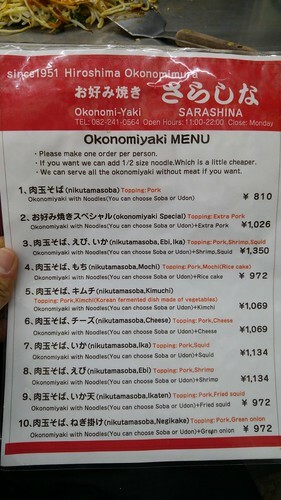 I love Okonomiyaki. I’ll be in Hiroshima two weeks from today!